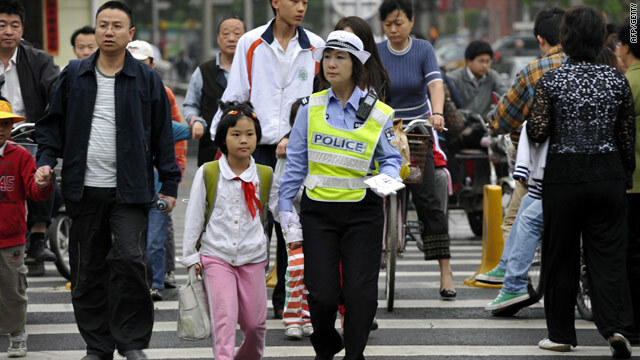 A policewoman helps a schoolgirl in Beijing on Tuesday -- China has introduced a range of measures to combat attacks on pupils. Beijing, China (CNN) -- One person has died from injuries sustained in an attack by a man with a cleaver who injured five others before committing suicide, according to state-run news reports in China. A 30-year-old woman died about noon Monday, according to the China Daily newspaper. One of the victims was released from hospital on Monday, the paper said, and the others were in stable condition, according to hospital officials. The newspaper identified the man only by his surname, Xie. The attack occurred about 7 p.m. Sunday (7 a.m. ET) in a market in Foshan, Guangzhou province, according to the report. The man, thought to be about 20 years old, jumped from a three-story building and died, according to the Guangzhou Daily newspaper. A witness said the man held a cleaver in his right hand and first rushed into a restaurant, striking a waitress on her shoulder before leaving and attacking another woman not far from the business, also on the left shoulder, Guangzhou Daily said. It was the latest of several attacks in China by assailants with knives or cleavers.